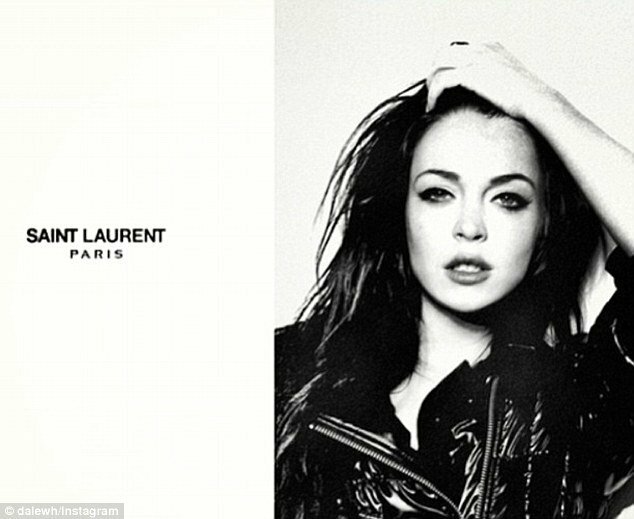 Lindsay Lohan has just appeared in a second spoof fashion ad in as many weeks. In a play on Saint Laurent’s high-profile new campaign starring Marilyn Manson and Courtney Love, Lindsay Lohan is seen staring seductively into the camera, wearing a glossy padded jacket. The image first appeared on the 5thVillage Instagram feed. The photo, in fact, is an edited shot of Lindsay Lohan modeling for the Italian clothing company, Fornarina, in fall 2010. It is not the first time Lindsay Lohan has appeared in a spoof commercial. Last month she starred in a spoof of Louis Vuitton’s Core Values ad series. The image, which appeared on the blog of Daniel Pianetti, showed her sat in court apparently admiring her lawyer’s LV embossed briefcase. And like the real ads, the photo was framed by a thick white border with the brand name spelled out in the bottom right-hand corner. While Lindsay Lohan perhaps wouldn’t fit with Louis Vuitton’s glossy image, her look certainly works for Saint Laurent – especially given this season’s rock ‘n’ roll theme. The troubled actress even worked with the label’s creative director Hedi Slimane in 2009. Hedi Slimane, 44, who is also a photographer, captured her in a series of provocative shots for his own portfolio, around the time her apparent weight-loss was starting to make press. However, for his latest Saint Laurent campaign, Hedi Slimane selected subjects to complement his music-inspired project. He opted for American musicians including Courtney Love, Marilyn Manson, Los Angeles-based rock artist Ariel Pink and former Sonic Youth singer and guitarist Kim Gordon.